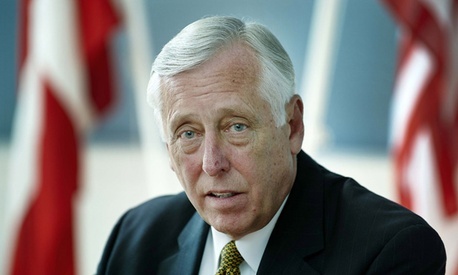 House Democratic Whip Steny Hoyer says his party won't agree to fix a typo in a GOP regulations bill that significantly alters the meaning of the measure. The bill calls for a moratorium on "significant" regulations (defined as costing the economy more than $100 million) until the unemployment rate hits 6 percent. Instead of unemployment, the GOP printed the word "employment." In a sign of the strained collegiality between the parties, House Democrats used the typo to criticize Republicans. On Tuesday, an aide to Democratic Leader Nancy Pelosi said that Republicans should stop "harping about 'red tape' and start looking for the white out." Rules Committee spokesman Doug Andres said the committee is weighing options on how to proceed with the bill, which was expected to hit the floor today. Andres said Republicans offered to fix the error by unanimous consent but was rebuffed by Hoyer, who told reporters today that Democrats would withhold their consent. "In their press release, the Democrats acknowledge that this was an error. We acknowledged the error and offered an easy way to fix the issue, but the Democrats don't seem to be interested in actually solving problems. We will act to fix this at the earliest opportunity," Andres said. News of Hoyer's position was first reported by Roll Call.